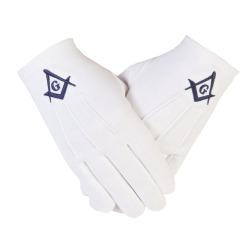 Freemason Masonic Gloves in Cotton with Blue SC&G It has Three darts with Button at the back. Made in Cotton in our Factory. We post all round country. We do them in Different Colours and sizes. Colours: BLUE BLACK GOLD SILVER LIGHT BLUE ect Sizes: XS S M L XL 2Xl 3XL as well. Freemason Masonic Gloves in Cotton with Blue S&C Lovely fitted Gloves. It has 3 Darts with Button at the back. Great Gloves for any service for your Lodge. 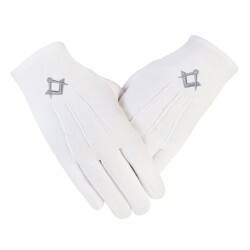 Freemason Masonic Plain Gloves with Three Darts in Real Kid Leather. (Without Buttons) Great Use Costumfor Services, Bands, Costume Dress, Stage Play ect We have them in different sizes as well. Size are: in XS S M L XL 2XlWe also sell them Globally as well. 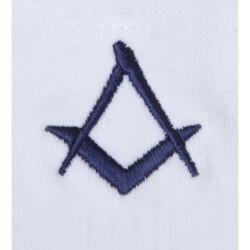 Freemasons Masonic Plain Cotton Gloves. 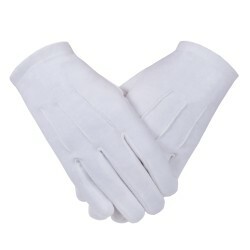 Plain Gloves can be used for Bands Funeral Parlor Silver Services Art Galleries ect We also do them in these sizes: XS S M L XL XXL XXXL.We have our own factory and we take our own images of Gloves as well.